Here we find Maiki harvesting Cape Gooseberries from the bush. A favourite hideaway spot in the heat of summer. Even green berries are a delicacy. 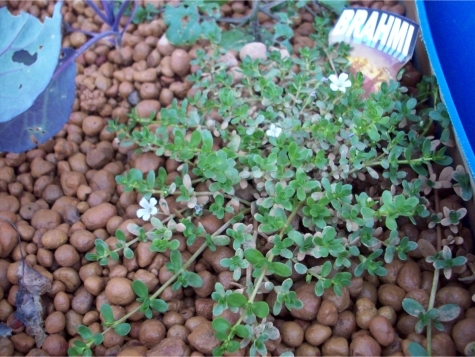 This is the little patch of Brahmi I had planted. It is creeping out and growing wider and even has small, white flowers on it at the moment. Quite pretty and a welcome surprise. 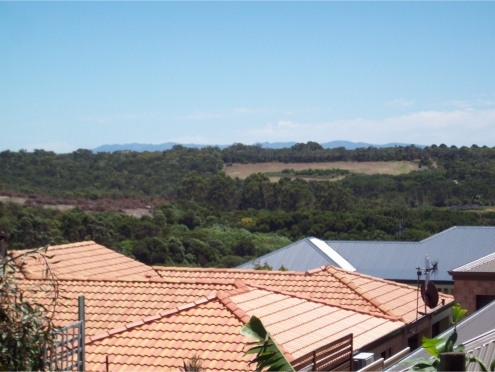 A clear, clear day with views to the Porongorups which are visible in this pic and also views of the Stirlings some 100 kms away. We don’t often get to see them due to haze and clouds. This picture is here because it is weather like this that I find that troublesome foe finds its way to the garden and dries things out. The Black Easterlies. This is what they can do to the garden. 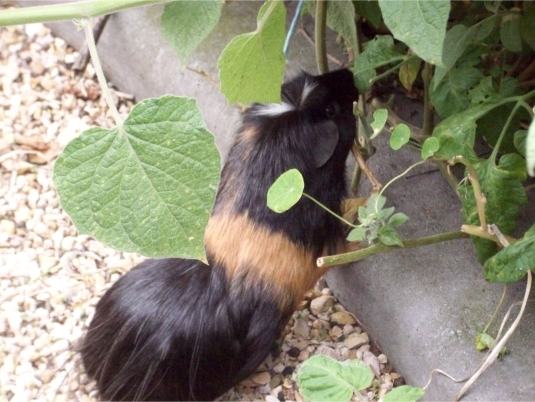 The choko especially dislikes the easterlies and many of it’s leaves dry out. Last year, after the same happened it managed to come back in time to grow new vines and leaves and bring in a super harvest of choko fruit. I am hoping the same will happen this year. These sunflowers however are going to get pulled out and I already have plans for the garden bed and many of the other garden beds. This will involve planting them out in drought hardy bushes and plants whereby I can use the back garden bed for other vegetables and the tubs for salad veges. These capsicum plants produced a small crop in the garden last year. Right where the above sunflowers are. A very dry patch of the garden, still, they did well. 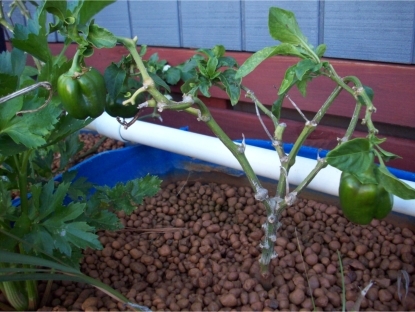 When I set up the aquaponics I literally ripped the capsicum out and put them in just to have something in the stones to get the microbes working. Much to my delight after more or less stagnating over winter, the plants have ‘come to life’ and are producing a nice little crop of fruit that will not fall victim to slater bugs or slugs or snails this year. The multitudes of celery seedlings I planted into the aquaponics beds are looking a little more vibrant and lush though I think the length of time it has taken for the system to kick in has meant they will be a little tough. Time will tell. The rest of the garden is a jungle. After spending days at hospital in the New Year with the birth of our son the garden was a bit neglected and in some ways did better for it I think. There were however numerous vines that need twining and pruning and shaping into place. Some tomatoes fell victim to the likes of Maiki and Jazz, but they were mainly ones that were self-sown, and probably from fruit the guinea pigs ate last year! The tamarillo is doing well and I am mindful of giving it plenty of water so it doesn’t drop too many fruit. The chickens are doing well. Not so many eggs at the moment, but they really have been left to themselves for a week or so. Loving the new spinach and silverbeet that gets thrown to them though. 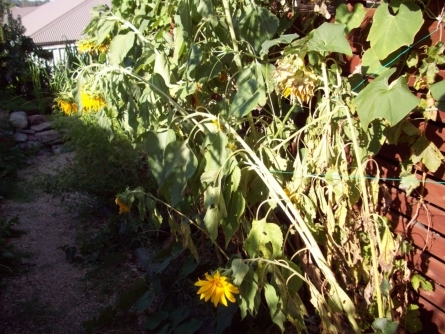 The backyard bed is drying out so I have had to keep water up to it for the sunflowers to yield and the corn to fill out. Some tomatoes hanging in there and a few surprise pumpkins and watermelons by the looks. Newly planted chilachayote from a month or two back are now taking off and making a run for it. Looking forward to seeing what these do.